My husband and I recently traveled to Vietnam and Cambodia. (Yes Karen, it was a group tour.) Growing up as part of the 60’s generation, I went with a definite feeling of ambivalence knowing that 60,000 Americans had died there. As a fairly uninvolved college student I remember going to some antiwar protests and even hearing Jane Fonda speak at a rally one afternoon. The war for me began to hit home in 1969 while watching the involuntary draft on TV along with others and being quietly glued to the screen while numbers were slowly drawn. My boyfriend at the time had an ominously low number & vowed to do whatever it would take to not have to go. My husband who I did not know then was also called up for the draft and he too used every trick known not to serve. Yet here we were 40 years later as tourists in Southeast Asia. Who would have ever imagined such a scenario? Prior to leaving, I partially read Stanley Karnow’s, Vietnam : A History. The book was way too long with too much information for my 62 year old brain. I put it down but my husband managed to fill me in throughout the trip about the lies and deceptions of our government. I read instead The Lotus Eaters a fictional romance between an American photojournalist and her Vietnamese assistant during the war years. 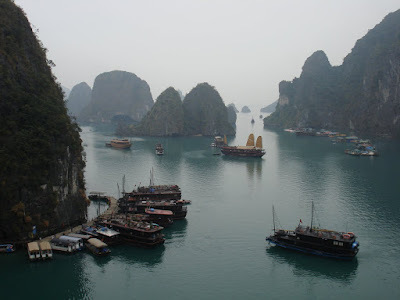 Being there, the setting and places took on a vicarious reality for me such as sitting at sunset with a drink on the rooftop terrace of the Rex Hotel where once war correspondents and officers hung out or traveling down the Mekong Delta by boat in the steamy heat. These romantic notions quickly gave way to the harsher reminders we saw of the war and its aftermath. We stopped at the Cu Chi tunnels the North Vietnamese had dug in the South some of it right under the noses of an American army base. In our posh hotel we saw tours advertised to the My Lai massacre site. We also visited the sacred grounds of a Killing Field in Cambodia. There was certainly a disconnect from the incredibly fertile green land we observed to the Agent Orange spraying and bombings which played out many years ago on the nightly news. Throughout our travels and all around us we saw temples and Buddha shrines and the faces of the people who either survived the war or were too young to remember. Our tour guides had all been born near the end or after the war, but they knew the stories. In Cambodia our guide knew from his family, many of whom had been killed, that you could not wear glasses, carry a book or even have smooth hands for under Pol Pot any sign of knowledge was a death sentence. Our guide in North Vietnam was born in 1975 and his parents were communists. At the Hanoi Hilton prison site he told us how well American prisoners were treated which we all knew to be a lie but it was his reality - a reminder that propaganda is never one sided. Often throughout our trip my husband and I wondered how could they not hate us? Was it their Buddhist religion or a communist sense that one must sacrifice individual feelings for the good of all. Our guides always seemed to infer that the past is over and that the people look towards a future prosperity. But perhaps forgiveness lies with the young who have no wartime memories and these are both very youthful countries as postwar countries always seem to be. 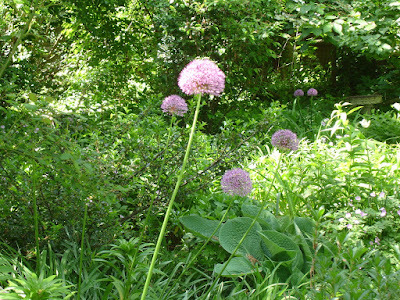 My garden is a jungle.We had an astonishing amount of rain this spring and I spend all my time hacking away at the exuberant growth. I’m not complaining because the inevitable drought will come and I’m now frantically mulching to keep the moisture in the soil. 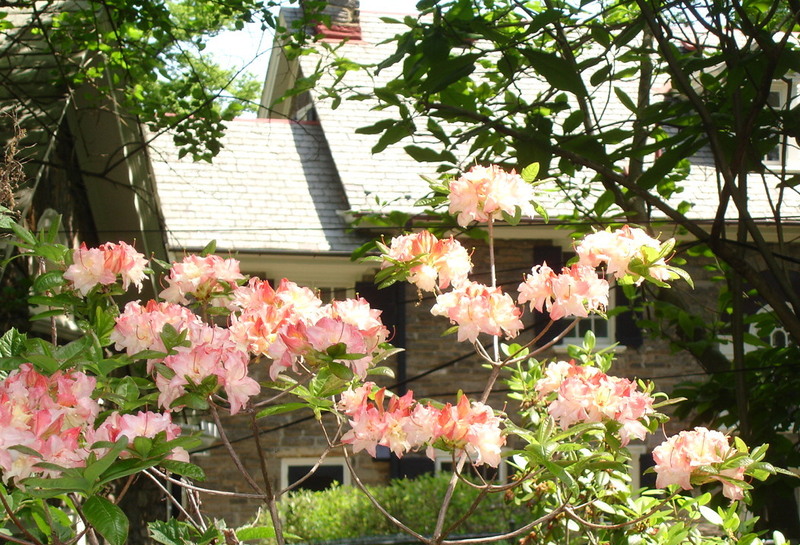 May is always a magical month in the Delaware Valley with our profusion of azaleas and rhododendrons. 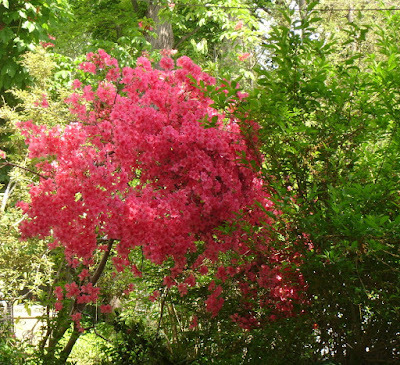 The bloom period is all too brief, but it is spectacular. 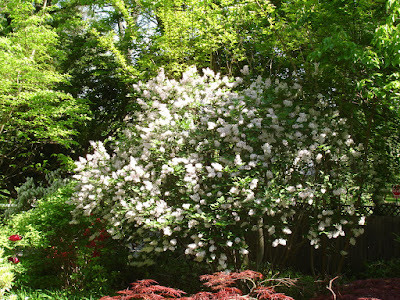 Among the stars of my May Garden: deciduous Azalea. 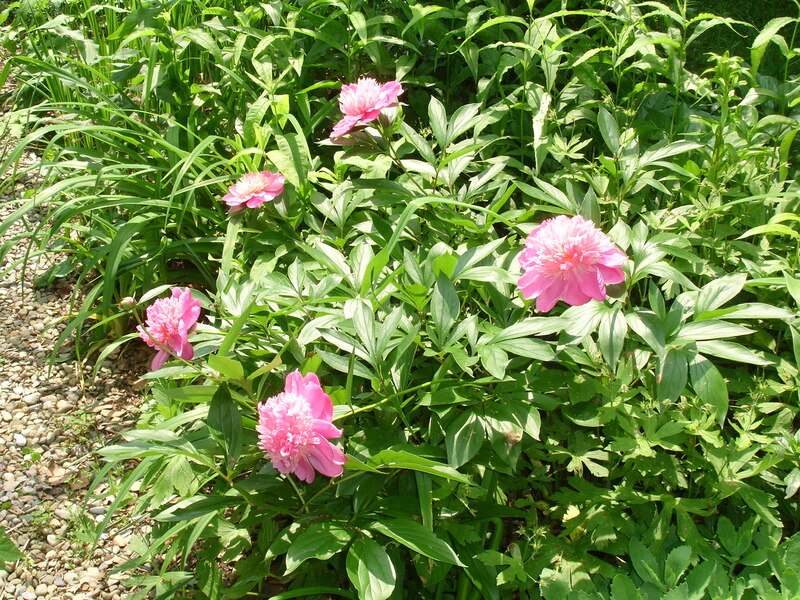 This is one those multi-season shrubs with gorgeous Spring flowers and purple foliage in the Fall. I’ve got to figure out a way to cram another one of these into my garden. 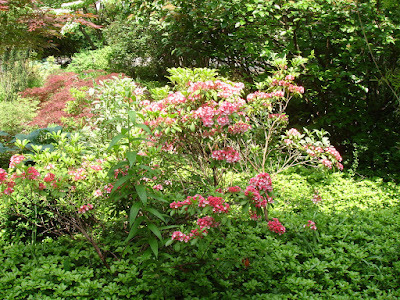 This is one of the plantings that came with the house, one of those old-fashioned azaleas with large flowers that are hard to come by in the garden centers these days. Considered a more garden worthy plant than the common lilac, Ms. Kim, a variety of Korean Lilac, is a shapely, extremely floriferous shrub with fall color and a powerful fragrance. 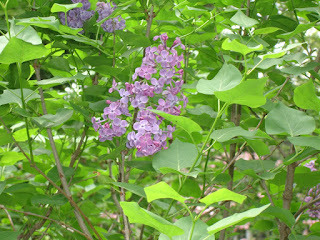 We have three of them in our garden, but I still prefer the ungainly syringa vulgaris for that fragrance to die for. Ms. Kim cannot compare in fragrance to her ugly cousin Syringa Vulgaris, and despite Ms. Kim’s undeniable virtues, I’ll take that common lilac fragrance any day. When the late tulips are gone, alliums rule until the iris and peony explosion: Alliums are tough customers needing little attention from the gardener. 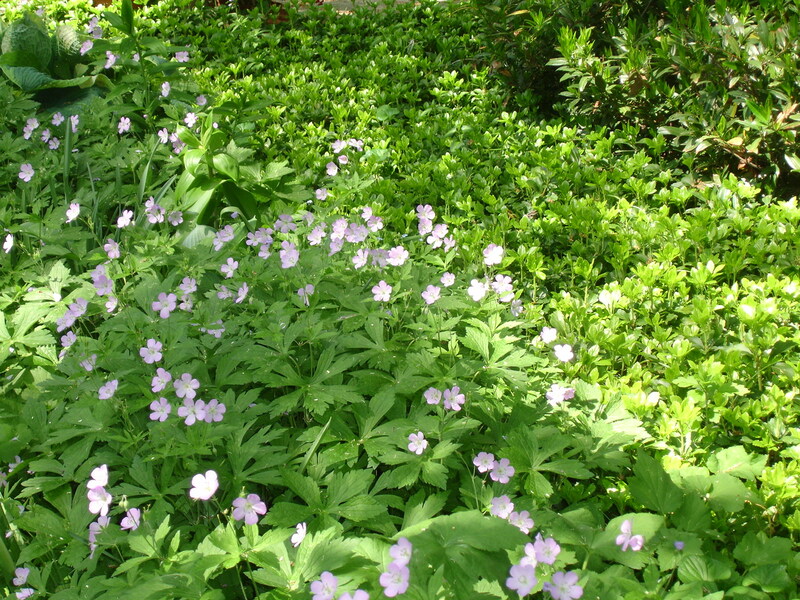 It maybe considered a weed by some, but Wild Geranium blooms during a lull in the garden and blends beautifully with the purple allium and Korean Lilac. After a bit of a lull in mid-May, the late May explosion of bloom begins: iris, peonies, early roses. 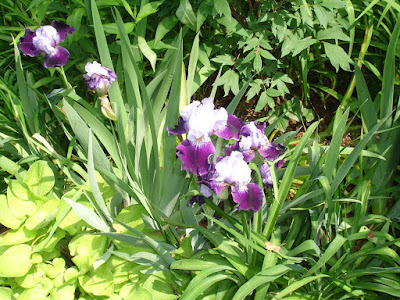 I love iris, especially the disease prone bearded iris. 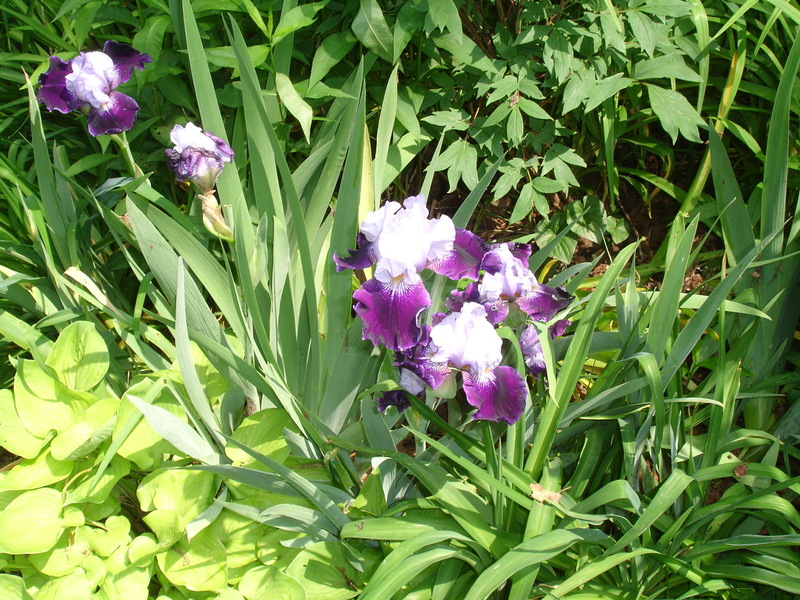 I will put up with a lot for that astonishing bearded iris fragrance. Then the peonies. 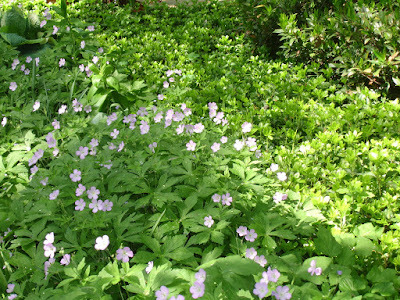 The flowers last only a few days but the foliage looks good all summer and the fragrance is heavenly. 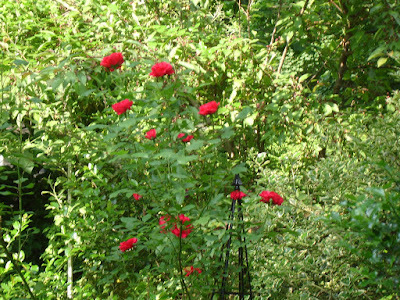 Fortunately, we have some older varieties that came with the house. It’s getting harder and harder to get that old time peony fragrance in the garden centers these days. 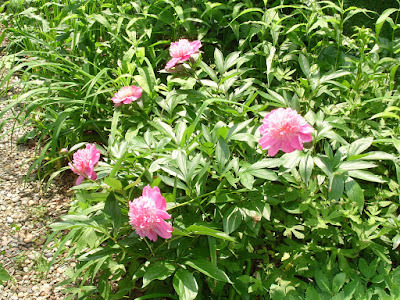 The fragrance of the early roses mingle with the peonies to produce something downright intoxicating. 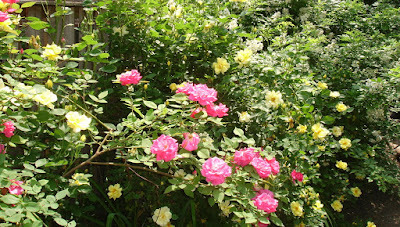 At this stage in my life, I only introduce tough customers into my garden and Blaze Improved is one of the toughest roses around—a little weak in the fragrance department, but a disease free, repeat bloomer. And finally, the crown jewel of my late May Garden, Cornus Koura or Korean Dogwood. We planted this beauty 20 years ago. 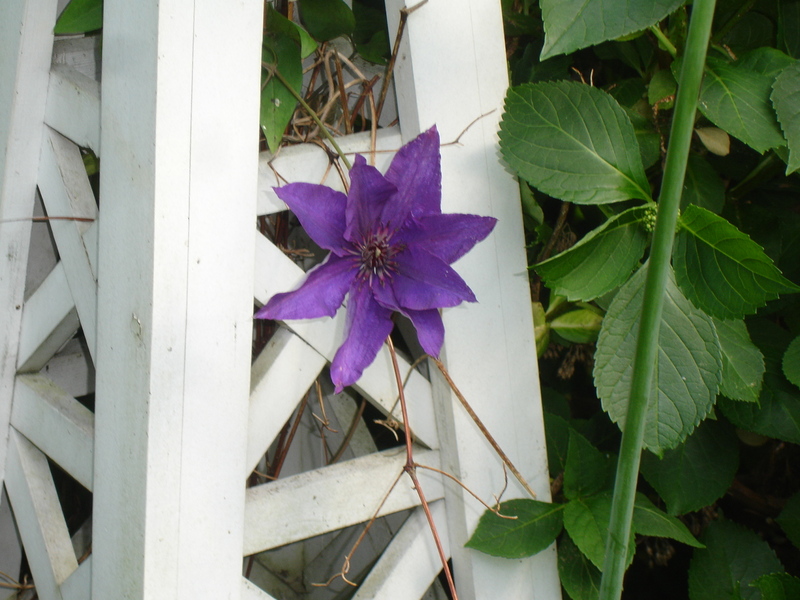 For about ten years there was no bloom. 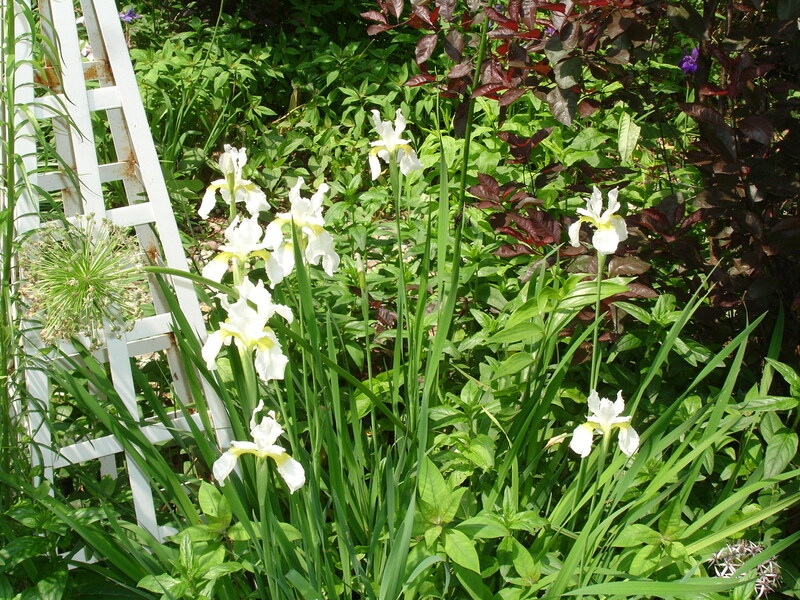 Then we started getting a few more flowers each year and finally this year, it came into its own and is covered with gorgeous large white flowers (actually bracts). Patience has its rewards. I’ve decided to a rest from the BlogHer book club, for a bit. At first it was kind of fun to get these books in the mail that I hadn’t heard about and therefore wouldn’t have chosen to read, but there’s just so much time for reading and I want to focus on my choices, my taste. 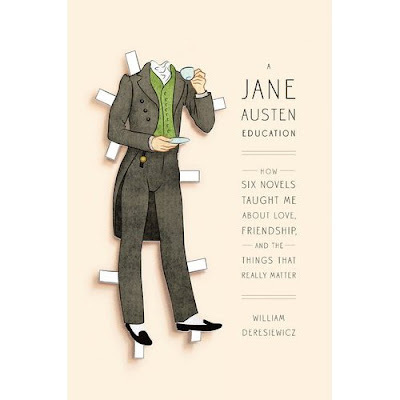 I wasn’t sure that the latest selection, William Deresiewicz’ A Jane Austen Education was the right book for me to review. Unlike most women of my generation who grew up on Victorian novels and majored in English, I’ve never been a fan of Jane Austen. I wondered if Deresiewicz could change my mind about Austen or at least convince me I should give her another chance. I grant that Austen is a talented writer and Deresiewicz an engaging one, but he has not convinced me to read Austen again. While I’ll acknowledge her merits—-she has created two of the most memorable characters in English literature, Elizabeth Bennett and Fitzwilliam Darcy—-I’ve usually found her tone somewhat smug and self-satisfied. And although she maintains some critical distance from her characters, most of the basic assumptions of her society are largely unquestioned. I grant that in her understated way, Austen does convey awareness of gender injustice--the limited options for educated middle-class women is a central theme in Austen’s work. However, the British class system is largely unquestioned. True, there are unflattering portraits of aristocrats in Austen’s novels, but the miserable lives of so many impoverished people in 19th century Britain is just simply are outside her characters’ (and one assumes Austen’s own) conscious awareness. What Austen condemns is callous rich people treating intelligent, educated middle class women like Austen with disrespect. Similarly, what Deresiewicz complains about is the way the glittering rich of New York City treat sensitive intellectuals like him with disrespect. Those of us who chose Pride and Prejudice couldn’t imagine how you could stand to read anything as immature and overwrought as Jane Eyre. Those who chose Jane Eyre couldn’t believe that you would subject your students to something as stuffy and insipid as Pride and Prejudice. Our choices, of course, reflected our personalities. The Bronte people, we Austenites felt, tend to go in for self-dramatization and ideological extremes. We regarded ourselves as a cooler, more ironic bunch. I’ve always distrusted these neat dichotomies: you love Dostoyevsky or you love Tolstoy; you love Walt Whitman or you love Emily Dickinson. etc., etc. I'm sure there are many readers who love both Pride and Prejudice and Jane Eyre. I’m clearly in the Jane Eyre camp and I don’t think it’s because I go in for “self-dramatization and ideological extremes” (at least I hope not) but for the emotional power of Jane Eyre—something I’ve always found lacking in Austen. A Jane Austen Education wasn’t really about Jane Austen; it was really all about William Deresiewicz—interesting if you’re interested in Deresiewicz. He is an engaging writer but the connection between his life and Austen’s novels struck me as forced. The book might work for some confirmed Janeites—but not for me. And some Austen fans like Ashleigh Burrows found the book annoying. The world Austen recreates, upper middle class life in provincial England with all its class prejudices and rigid gender roles, is a world thankfully long gone. I don’t think I want to spend my time in that world. Just read an excellent article by Deresiewicz on the crisis in higher education in the Nation. He should stick to this kind of writing—he’s very good at it. Thanks to the BlogHer book club, I've been reading books I would never have picked up on my own. The latest to arrive in my mailbox was Girl in Translation by Jean Kwok. It was a fun read but with some of the flaws so often characteristic of a first novel. I’m finding that despite being retired for two almost two years that I have a hard time taking off my teacher hat and continue assessing a novel for its classroom potential. Old habits die hard. When I was teaching developmental English at Community College of Philadelphia, Girl in Translation was just the kind of book I was looking for -- a clear narrative line, straightforward syntax, a manageable vocabulary, but with some complexity and which addressed real social issues. In short, I was always looking for a book that college students with weak reading skills could handle, but one which raised serious issues and introduced my students to a different world. For many years, I was determined to teach challenging works and convinced that somehow I could make students fall in love with the books I had loved so much. We had some interesting discussions about issues raised in these books but when the narrative complexity was too great I failed miserably to engage students with the texts themselves. Toni Morrison, Maxine Hong Kingston, Nadine Gordimer, and Gabriel Garcia Marquez (my all time favorite authors) were just too much of a stretch. Most of my community college students could handle the linguistic challenges of Jean Kwok’s Girl in Translation and would be intellectually challenged by the issues the book raises. There’s one issue in particular which I think would resonate with my community college students: the extent to which educational aspirations can create distance from one’s partner. 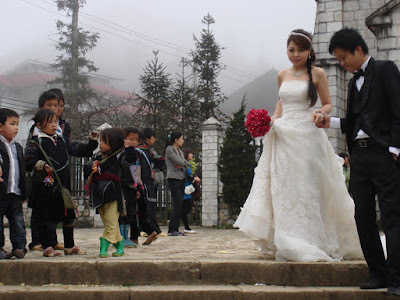 The novel’s central character, Kimberly Chang, realizes she has a choice between her educational goals and her relationship with her first love, who like her was from a struggling Chinese immigrant family. Over the years I saw young men -- particularly African-American men-- disappear from my classes. My female students’ partners, were not pursuing higher education and many spoke of increased tension and growing distance from their partners. I found Kimberley’s adult relationships far less interesting than the earlier chapters of the book in which Kwok describes Kimberly’s experience working in a sweatshop and living in extreme poverty. These chapters were, for me, by far the most compelling. Don't worry. We have a financial aid program. You are applying after the normal process has closed but I’m sure we can make an excession for you. Sometimes we offer up to fifty percent of twosheen costs. One of the greatest compliments I’ve been given is when native Chinese speakers tell me what a pleasure it was to read the language, and how they had to chuckle at the Chinese expressions. Non-native speakers seem to love this experience too -- it’s like they can suddenly speak Chinese! However, my deeper goal was to show people how very difficult it is for a foreigner in a strange country. So many people are articulate and intelligent and funny in their own language, yet are judged as ignorant because they don’t speak the dominant language well. In some ways the plot is a cliché: a young immigrant girl through talent and drive achieves the American dream, but pays a price in terms of distance form her cultural roots. However, although we may have read this story line many times before, the details are fresh and new -- all in all, an enjoyable read with great classroom potential. The ending is problematic and Blogher created a spoiler thread for those of us who wanted to discuss the ending without giving away the plot. So stop reading if you think you might read Girl in Translation. Here comes the spoiler. Since the spoiler-y comments I've seen seem to be really focused on not talking about the end... the end where Kimberly is pregnant and heads to the clinic for an abortion... only to change her mind after seeing "her son" on the ulstrasound. That's where I'll start. I won't even go into the ultrasound portion right now -- I just don't think Kimberly would have made the decision to have an abortion and then change her mind. Nowhere in the book did Kimberly ever change her mind about anything. She thought things out. She learned things before making decisions. But she never once, as far as I can remember -- changed her mind. That's the only part of this book that just didn't sound right to me. Not because I'm so pro-choice and am frustrated by the ultrasound being used as a weapon against women who choose abortion... but because it didn't sound like Kimberly. The ending very much bears the earmarks of a first novel. I agree with Denise that Kimberly’s decision not to have an abortion was inconsistent with her character. Sure, even driven focused characters like Kimberly could be overcome with powerful conflicting feelings and reverse a major decision at a critical moment BUT Kimberly’s character would have to be developed more fully to make her reversal of her decision more believable and consistent with the previous characterization. Another earmark of a first novel(especially a partly autobiographical first novel) is the author’s lack of distance from her character. If Kwok views her character critically, it’s not apparent—at least not apparent to me. But these are flaws which can make for great classroom discussion. That teacher hat again! When I was working, I was always desperately trying to catch the magic of early spring, but my job— those mountains of papers to grade—kept getting in the way. 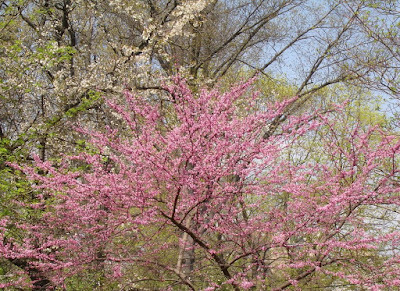 I thought that when I retired I could really savor early Spring and it wouldn’t seem to pass so incredibly quickly. 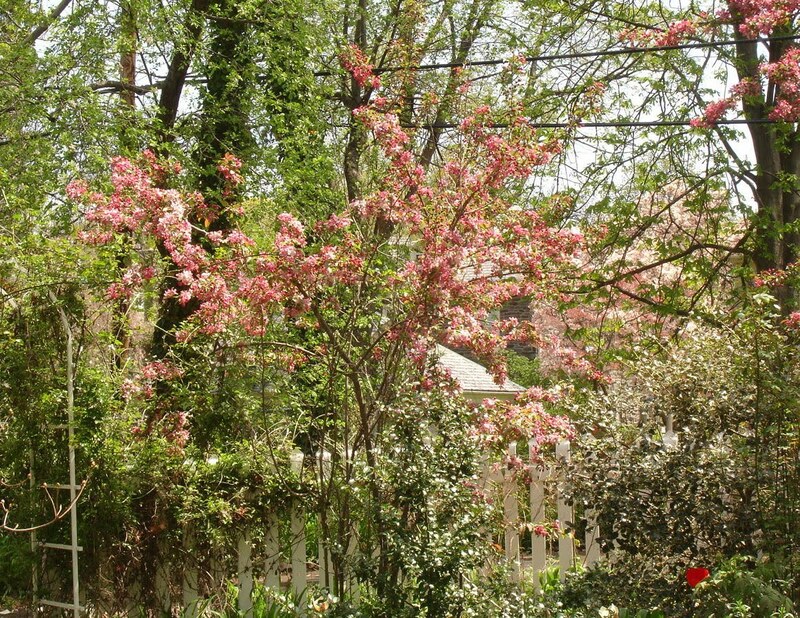 I missed that magical third week of April last year—the usual time for the great Spring awakening in the Delaware Valley-- because of our rescheduled trip to Peru. This year I finally had the time to spend just about every waking moment in the garden, but it still passed far too quickly. 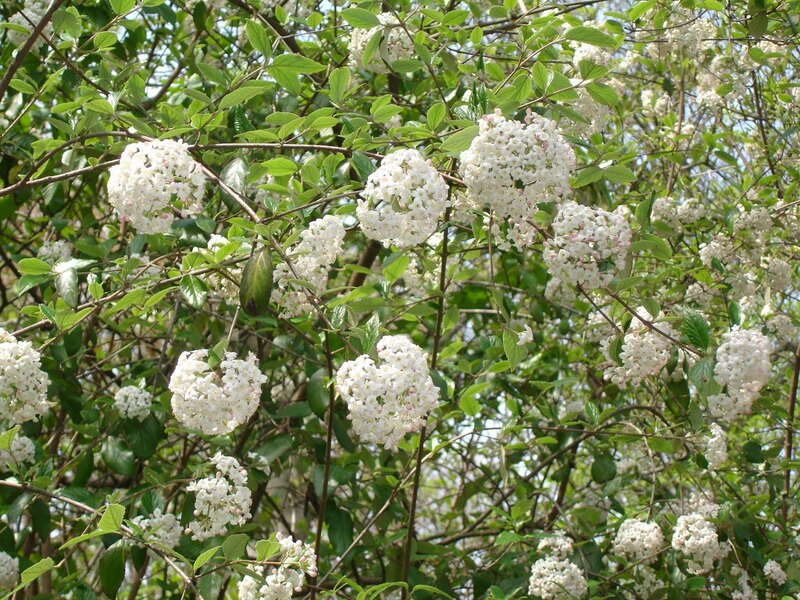 I felt that I barely had time to smell the viburnum. There's just no way to put this in slow motion. 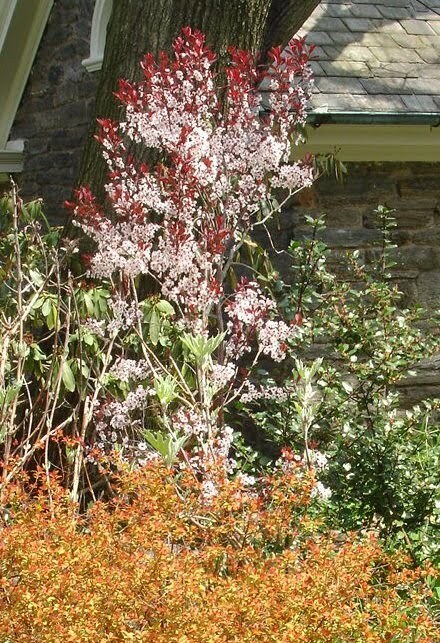 Given the fleeting nature of Spring flowering trees and shrubs, the garden books always advise selecting shrubs and trees for multi-season interest. I’ve tried to do this, but there are some shrubs so magical for a brief period that I’ll put up with the fact that they are nothing special 51 weeks of the year. 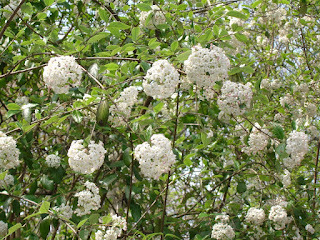 Carlesii Viburnum is a scraggly shrub with nondescript white flowers which tend to bloom for a short time the third week of April. 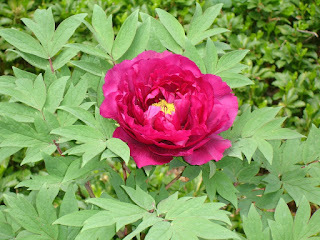 But for those few days, they produce the most astonishing fragrance. 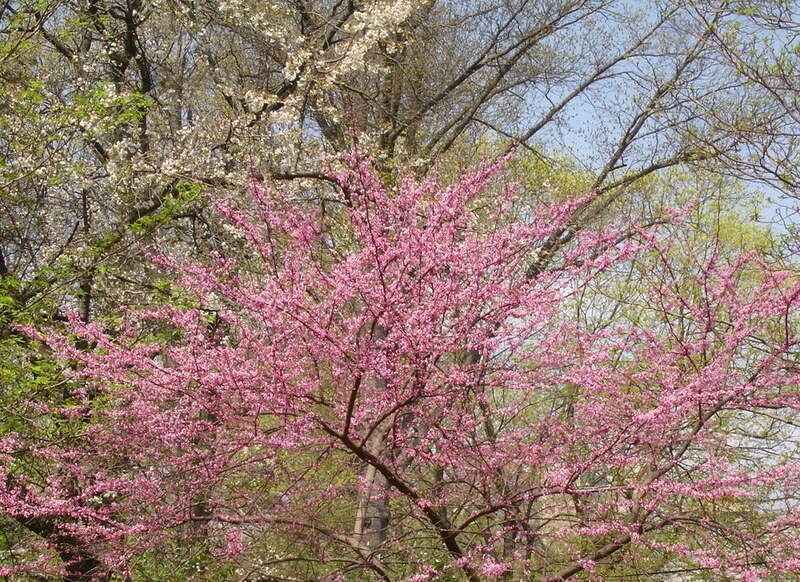 The delicate blossoms of sand cherry ( Prunus Serotina ) another tough plant are also part of the mid to late April explosion. The flowers may not last long but the foliage stays deep purple all summer and turns bright red in the fall. By the 4th week of April, all these beauties are usually gone; then the crabapples puts on their show for a very brief period. 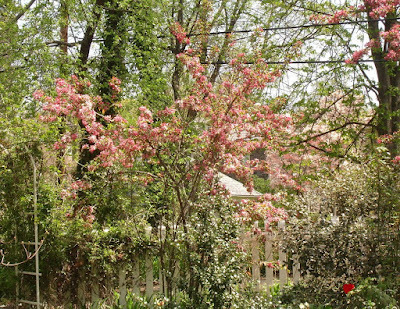 The crabapple is one of those small trees recommended for multi-season interest; it gets Fall color and berries that persist throughout most of the winter. 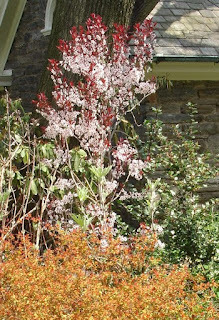 Supposedly, the birds don’t like them and only turn to the crabapple fruits when everything else has been picked clean. Then in the last week of April what I'm longing for most : the common lilac that has the most spectacular fragrance in the world. For (at most) a week of that fragrance it’s worth putting up with a raggedy plant that gets unsightly powdery mildew at the end of the summer. 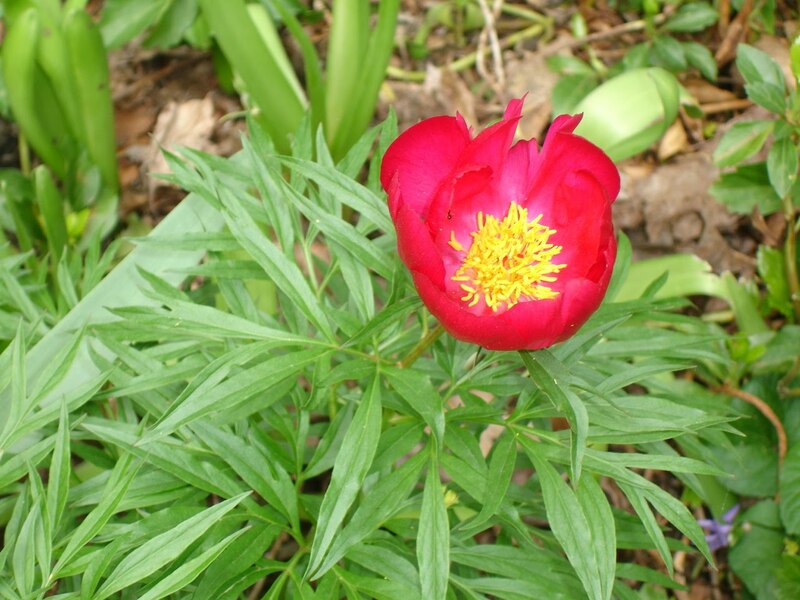 In the beginning of May the early peonies start beginning with the graceful fern leaf peony, then the spectacular flowers of the tree peony (so called because it doesn’t die down to the ground and thus provides “winter interest”). These are the most fleeting of all—-sometimes only a day or two if there’s wind and rain. 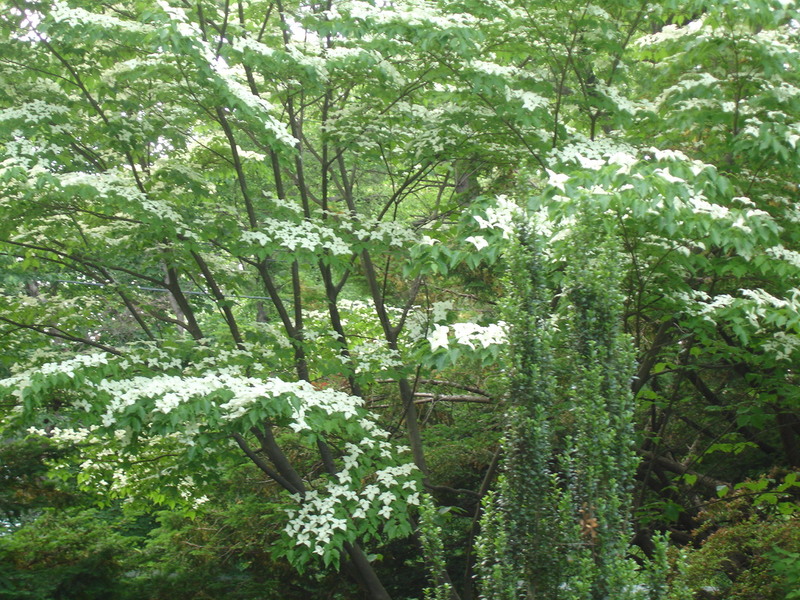 By the first week of May everything has leafed out, the pale green leaves of April have darkened and my garden already looks like a jungle. If only I could slow this down!!! !